When you hear the word Africa, the last thing you think about is the sea and the islands. Most of the people consider that Africa has only vast deserts and jungles but in fact, the black continent is much more diverse. 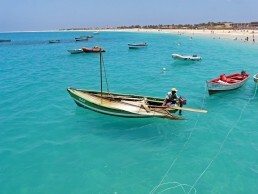 So if you are up for a new type of African adventure then book yourself a ticket to the small country of Cape Verde. With the cold weather here, and the holidays right along with it, it is the time to take a trip to somewhere nice, warm and sunny. Fortunately for you, I have the perfect place to go to, known as Cape Verde. Cape Verde is a collection of about 10 islands that attract tourist all year round, because of the year-round warm weather and lots of activities to do.